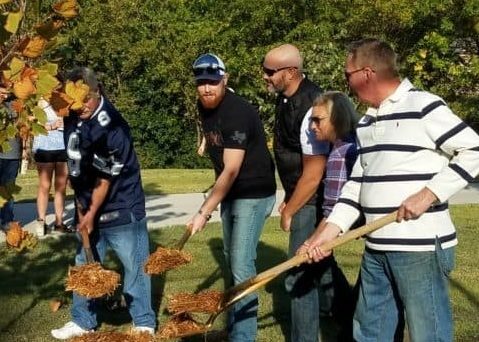 Bavarian Grill restaurant celebrated its 25th year of business by purchasing and helping to plant 29 trees in Plano’s Chisolm Trail Park and in the restaurant’s shopping center. It began with a team meeting to discuss what the restaurant could do to celebrate and benchmark their 25 years of business in the Plano community. The team members wanted to do something that would benefit the citizens of Plano to show appreciation to their hometown while also honoring their commitment as a Green Certified Business. In 2015, Bavarian Grill was awarded the Environmental Star of Excellence Business Award by the City of Plano for their impressive 70% recycling rate, investment in LED lighting and use of compostable to-go containers. The team members also wanted something they could participate in on a Sunday and included a Texas BBQ picnic. It sounded like a tall order to Juergen Mahneke, founder and owner of Bavarian Grill. He thought about what they could plan to celebrate their quarter of a century milestone while also checking off the wish list his team members gave him. While attending the Environmental Star of Excellence Awards Luncheon as a prior winner that year, the keynote speaker inspired him to plant trees in a Plano city park. Since he has walked nearly every day for the past 29 years in the Chisolm Trail Park with his dogs, Mahneke thought the park would be a great place to add trees to the community. The park also holds a special place in his heart because during one of those walks he met his wife, Heather. Mahneke presented the idea of planting trees in a nearby park followed by a picnic in the park to his employees. After receiving their full support he went to the City of Plano Management with the idea. The city’s urban forester, Angie Kralik welcomed the idea and connected him with Matt Grubisich, director of operations and forestry with the Texas Tree Foundation. Grubisich visited the park with Mahneke and saw the need for more trees. Grubisich explained that the major cost when planting trees is providing the irrigation and in this location the cost was estimated to be $720 for each tree. They agreed that 25 trees were needed and Bavarian Grill pledged to fund half of the cost for the trees and irrigation and would raise the other half among their guests, friends and companies. Before long Bavarian Grill gave Texas Trees Foundation checks for a total of $20,635, more than was needed for 25 trees. The restaurant’s guests, friends and other businesses generously supported the campaign. Bayern Stein Club members were large contributors. Soon the Texas Tree Foundation volunteers were planting Bur Oak, Monterrey Oak, Bald Cypress, Mexican Sycamore, Chinquapin Oak and Redbud trees in Chisolm Trail Park for Bavarian Grill team members, family and friends. A total of 29 trees were planted in the park and an additional two oaks were planted in front of their restaurant. Sponsors included: Hirsch’s Meats, Secure Wireless Frisco, German European Imports, The Snooks, The Russels, The Lytles, Kathryn Harris, Gary Coats, Phillip and Julia Walden, Rich Chronister, Tom R. Williams, Cai, Douger, Micharel and Angela Harper, Dauntless Industries, John A. Koepke, Fred David, Copper Creek Homeowners, Ben E. Keith Food, Ben E. Keith Beverage, James and Joe Klingele, Bayern Bier Club, Floyd Wood, John “Johann” Kaufmann, David Krysiak, The Rommels, AFPAAA—DFW Chapter, Brad and Annette Couch, Crs Solutions, Tyler, Nick and Christian, and Ken Sweazey.